No boring breakfast here! 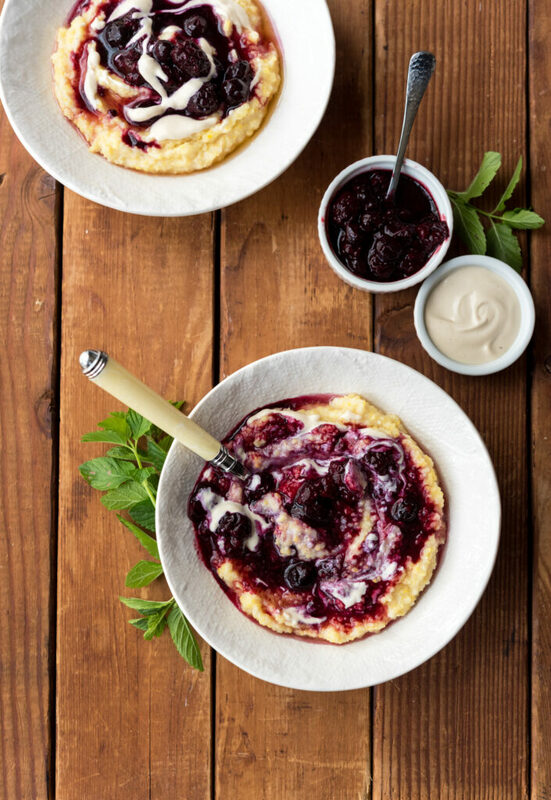 This light and creamy polenta is sweetened with fresh berry compote and is so delicious, it could pass as dessert. When people talk to me about being vegan, one of biggest roadblocks they face is the amount of time it takes to prepare vegan dishes. The reality is, any time you change how you eat or start to clean up your diet, there will be a period of transition…BUT that doesn’t mean you’ll be spending hours in the kitchen. And Vegan Yack Attack On The Go is proof of just that! 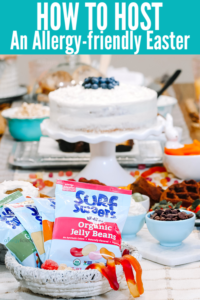 Jackie Sobon provides the tools and recipes for creating delicious, plant-based meals that are quick, easy to make and portable, which will fit into your busy life! 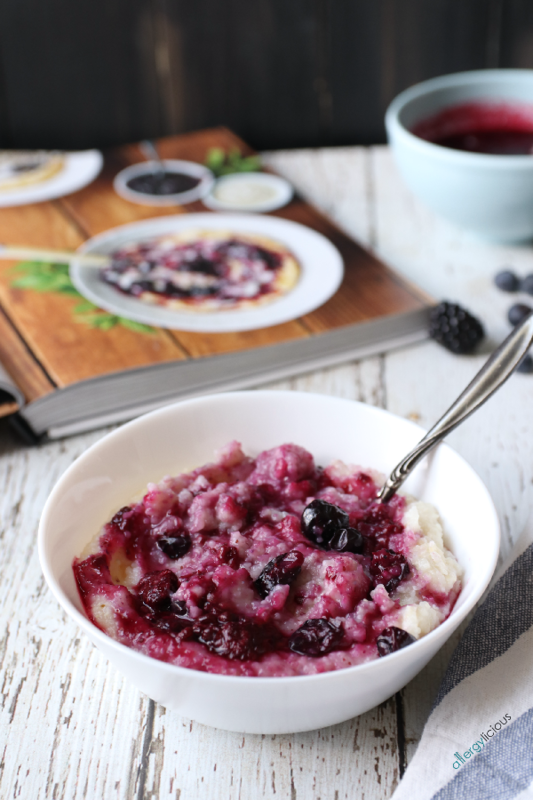 Keep reading to get the recipe for Jackie’s Creamy Berry-full Polenta and giveaway. Jackie Sobon is the author of Vegan Yack Attack: On the Go, although you may know her from her previous cookbook or popular food blog, Vegan Yack Attack. 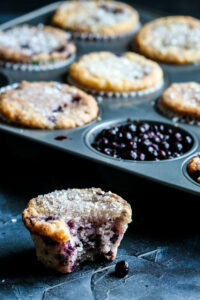 Her recipes are creative and yummy, and her photography is stunning! This cookbook showcases her love for plant-based food and provides you with recipes that you will not only want to eat, but can whip up in a short amount of time. Just wait until you see the gorgeous photos that go along with most of the recipes. I’ve already made a handful of recipes after seeing the photos, so I know you’ll want to quickly try them as well. 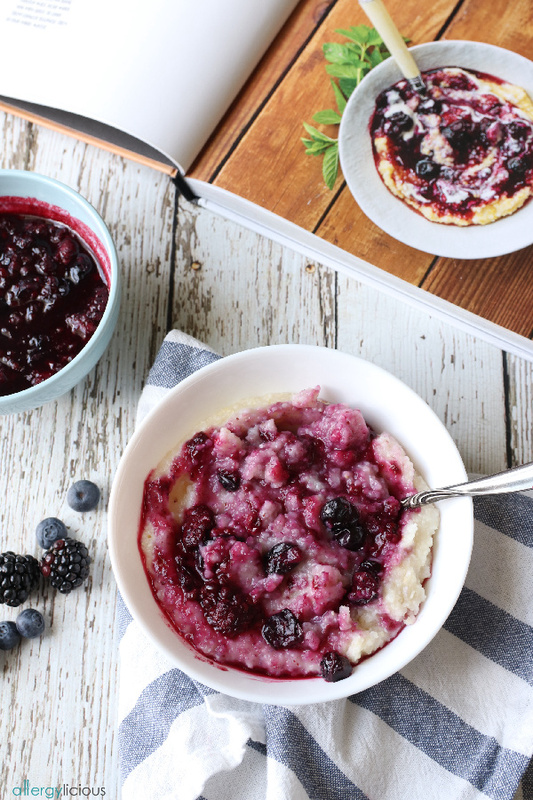 But first, the Creamy Berry-full Polenta recipe! 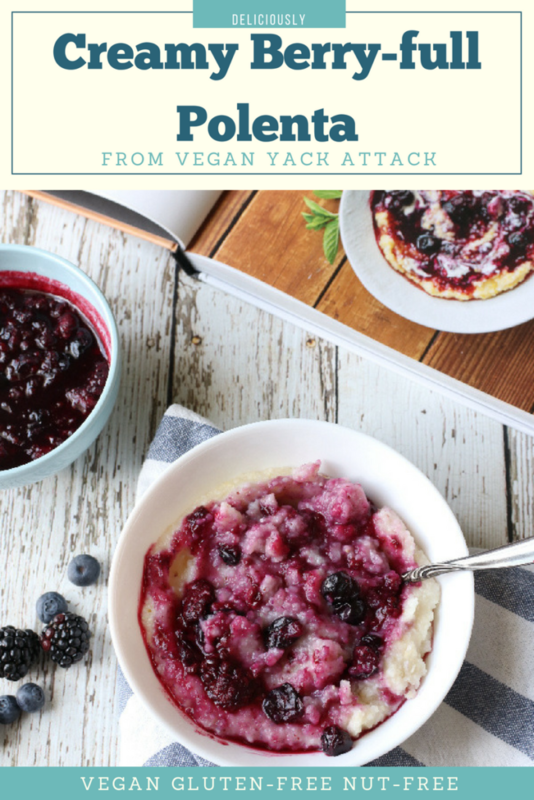 This Creamy Berry Polenta was made with an handful of healthy ingredients, I already had…. dairy-free milk, water, polenta, maple syrup, salt and berries. The polenta is extra creamy thanks to cooking it in milk (I used coconut miolk) and then sweetened slightly with maple syrup and warmed berries. For an extra treat, Jackie recommends topping with her Simple Cashew Cream, however since we have a nut-allergy, we opted for a swirl of vegan yogurt which was a lovely addition. You guys MUST try this Creamy Berry-full Polenta first, then make your way through the rest of Jackie’s delicious on-the-go recipes. 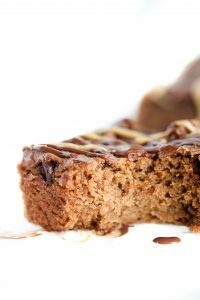 Even if you have additional food restrictions like gluten-free or nut-free, you still have so many to recipes to choose from. Many recipes are free-from or adaptable to fit your dietary. All that said to say…. 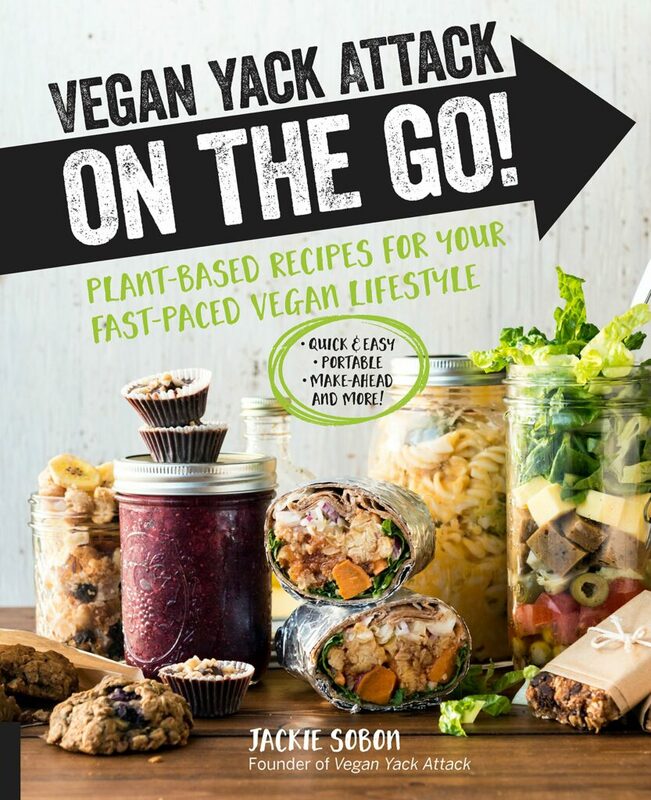 you’ll love this cookbook and should probably just go ahead and order Vegan Yack Attack On The Go right now. Or, you can enter the giveaway below, to win your own copy. Are you sick of oats? I don’t think I’ll ever be, but it is still nice to switch up my grains in the morning. 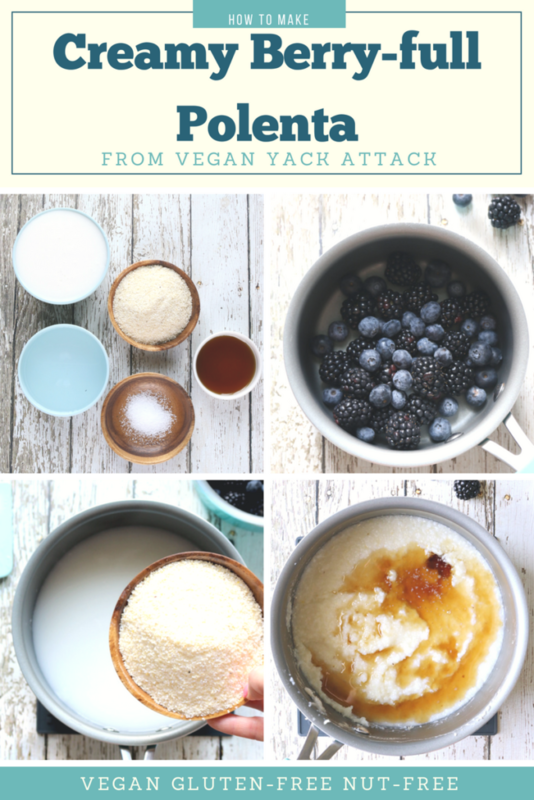 Polenta cooked with nondairy milk is extra creamy and goes wonderfully with warmed berries. Extra points for keeping some Simple Cashew Cream (page 186) on hand to dollop onto this delicious breakfast. In a large pot over medium-high heat, bring the nondairy milk and water to a boil. Stir in the polenta grits, and adjust the heat to medium-low. Cook—covered but vented, stirring occasionally—for 18 to 20 minutes, or until the polenta is creamy. Stir in the maple syrup, and add salt to taste. Keep warm until ready to serve. While the polenta is cooking, warm the blueberries, blackberries, and water in a small saucepan over medium heat. Bring to a simmer, adjust the heat to medium-low, and cook until the berries start to break down, about 10 minutes. Lightly mash the berries if they are not breaking apart. Divide the creamy polenta between 4 bowls, and top each with some berry mixture. Dollop 1 tablespoon (15 ml) of Simple Cashew Cream on top of each bowl (if using), and serve warm. Soak cashews in boiling hot water for 15 minutes. Drain and rinse cashews, then place them in blender with 1/3 cup (80 ml) water, to start, plus salt. Blend until completely smooth, adding more water if your blender is struggling. Refrigerate until ready to use, it will continue to thicken as it cools. Keeps for 7 to 10 days in refrigerator. *If you do not have fresh berries on hand, frozen will also work. You may have to cook them longer because they retain more water. **To keep this nut-free, omit cashew cream and simply add a dollop of vegan yogurt. Oh yes! Do you pre-make them or buy some of the yummy frown kinds? Usually I’ll have a nutrition shake or bar on the go. Oooh, can’t go wrong with either of those. On the go, I usually eat a vegan bar. I’d love to know…which bar is your favorite? I am with her. I usually like protein shakes. I would rather drink than snack! We do a ton of protein shakes here as well!